The proseminar in philosophy (PHL 1111H) during the fall session of Academic Year 1. Normally, 2 courses in History of Philosophy; see Breadth Requirements. Normally, 2 courses in Contemporary Problems of Philosophy; see Breadth Requirements. Students may take up to 2 courses as Independent Studies courses as part of the degree. These must be done with a faculty member of the department, and only when suitable regular courses are not available. With permission of the Director of Graduate Studies, a student may replace up to 2 courses in philosophy with graduate courses offered by other units, provided that the course is required for the student’s planned research. The School of Graduate Studies (SGS) may grant credit for up to 2 courses for graduate work in philosophy undertaken at another university. Such work may be completed either before or during one’s PhD program. In the latter case, SGS must be shown that the coursework in question both is essential to the student’s program and is not simultaneously available at the University of Toronto. Any request for such credit must have the support of the Director of Graduate Studies. Courses taken for graduate credit are assigned a letter grade according to the following scheme: A+, A, A-, B+, B, B-, and FZ (which replaces C, D, and F). For more information on assessment, see the University Assessment and Grading Practices Policy on the School of Graduate Studies website. Deadlines for course work, as set by the department and the School of Graduate Studies, apply to all students taking philosophy courses, regardless of the department, centre, institute, school, program, or university in which they are enrolled. 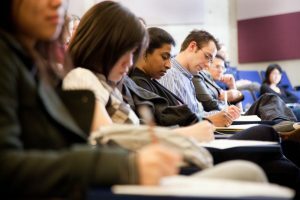 The instructor in each course is required to inform the students in writing of the deadlines for course work at the first meeting of the course. For further information on coursework extensions, see the Policy on Departmental Coursework Extensions in the Policies and Procedures section of this website. Students wishing to audit a course must receive permission of the instructor. The instructor may require active participation in seminar meetings as a condition of auditing.